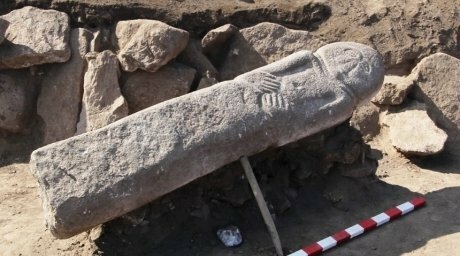 Kazakhstan archaeologists have discovered an Saka-era granite sculpture near Karaganda. The unusual sculpture resembles the Scythian monuments of the Black Sea region, Nv.kz writes. The archaeologists believe that this discovery is yet another confirmation of a direct link between the ancient tribes that lived in Eastern Europe and Central Asia. Three years ago Kazakhstan archaeologist Arman Baissenov discovered gold in a Saka tomb in Karkaralinsk. This time there were no precious metals in the tomb. But the archaeologists are still very happy with the unique granite sculpture of the Saka era. According to him, the sculpture was not covered by soil. It was just standing on the side of the tomb surrounded by rocks. “That was a good location. Had it been placed at the top of the tomb, it wouldn’t have made it to our days. Back in the 1960s, when the historical heritage was destroyed, tractors would have removed and damaged it,” he explained. The archaeologist says that the sculpture resembles a woman, even though she has no breasts. “And, most important, there is no military ammunition: belt, knife, etc. You can clearly see her eyes, nose, mouth, head and ears. There are two parallel lines on the neck to show that the woman had wearing a decoration on her neck. This means that she was one of the nobles, not just some housewife. Apparently she was some ruler, head of the tribe or the wife of the local ruler,” Beissenov said. The archaeologist believes that the sculpture comes from the early Saka period. According to him, this is around the 8th century B.C. However, defining the exact age requires a radiocarbon analysis in Europe, which is expensive.